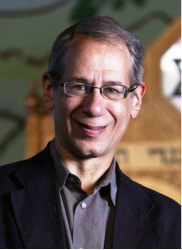 Rabbi Howard Voss-Altman has served as the Senior Rabbi of Temple Beth-El since 2015. He grew up in Englewood Cliffs, NJ, and graduated from Duke University in 1982 with a B.A. In Political Science and received his law degree from Washington University in St. Louis in 1985 where he was an Associate Editor of the Law Review. As an attorney, he specialized in labor relations and employment discrimination. Rabbi Voss-Altman was ordained from the Cincinnati Campus of HUC-JIR in 1999 and served as an Assistant Rabbi of North Shore Congregation Israel in Glencoe, Illinois from 1999 until 2002. He then became the rabbi of Temple B’nai Tikvah in Calgary, Alberta, where his rabbinate focused on building a strong spiritual community, pastoral care and counseling, and community and social justice issues. Rabbi Voss-Altman received Alberta’s Centennial Medal of Honour in 2005, and has served as the chair of the Canadian Association of Reform Rabbis, and the Calgary Interfaith Council. He has also served on the board of the Metro Alliance for the Common Good, Imagine Calgary, the Muslim-Jewish Alliance, the Calgary Council of Christians and Jews, and the Rabbinic Cabinet of the Canadian Rabbinic Caucus. Rabbi Voss-Altman serves on the Board/Steering Committee of the Rhode Island Interfaith Coalition to Reduce Poverty. Rabbi Voss-Altman and his spouse, Annie, have been married since 1991. Annie is a practicing attorney, focusing on criminal law and Constitutional interpretation. They have three children, Emilie, Judah, and Adi. As a family, they enjoy theater, cinema, travel, music, and, especially, visiting Disney World.